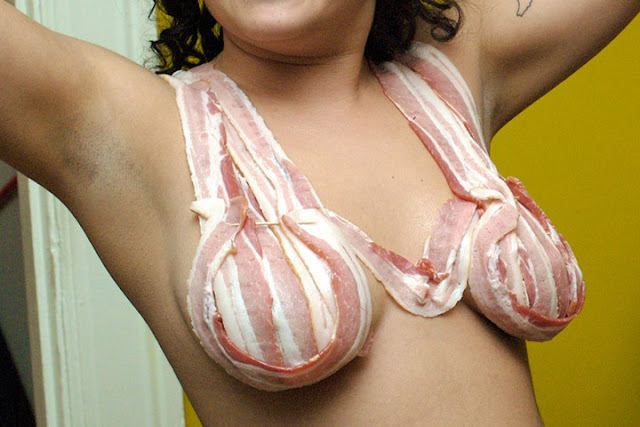 Music's biggest thing since Madonna stuck a pose, Lady Gaga has again stirred up the critics, punters and most importantly, that most obnoxious of lobby groups, Peta by posing in a meat bikini for Vogue Magazine. You may recall how Pink once gotta caputured by Peta's ideology - not Lada Gaga, she takes her meat seriously and was happy to pose for a Vogue Magazine cover. Hold the Telephone, this is actually a PSA add! Let's face it, she's actually doing a public service, inspiring young women all over the world to eat meat to get their iron levels up. Anyways, PETA's all round gimp Terry Richardson said of the Vogue cover, saying "meat is something you want to avoid putting on or in your body," and that "no matter how beautifully it is presented, flesh from a tortured animal is flesh from a tortured animal."